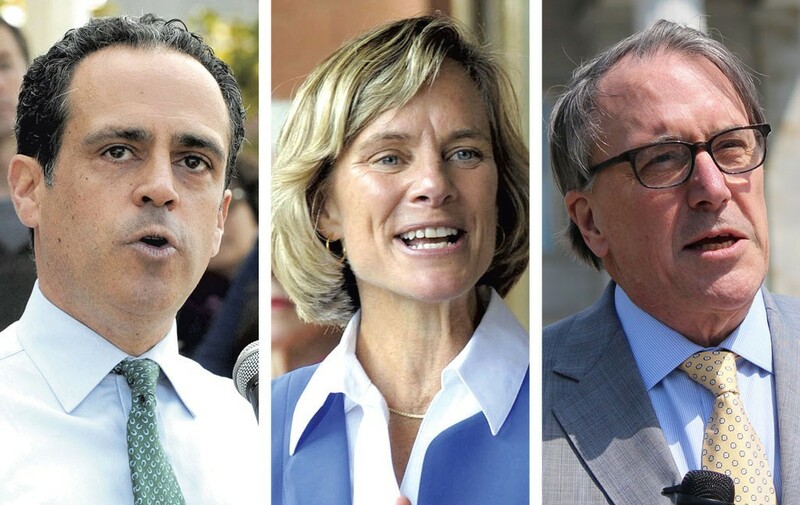 At their last major debate before next week’s primary election, Vermont’s Democratic gubernatorial candidates assailed one another Thursday over how they — and others — have funded their campaigns. The Vermont Public Radio debate, broadcast live from Montpelier, came as a flood of outside money inundated the state’s small-dollar political system. Within 24 hours, two super PACs appeared out of nowhere to finance television advertisements for Democrat Sue Minter and Republican Bruce Lisman. In the same period, Silicon Valley venture capitalist Reid Hoffman personally financed a raft of ads for Democrat Matt Dunne. A third Democrat in the race, former state senator and ambassador Peter Galbraith, used the debate to accuse his primary rivals of hypocrisy for benefiting from the outside cash. Both Minter and Dunne, Galbraith noted, had “made a great show” of refusing corporate campaign donations earlier this year. Galbraith, a longtime proponent of campaign finance reform, suggested that Dunne had illegally coordinated with Hoffman and called on both of his opponents to denounce their respective benefactors. Dunne was referring to Vermonters for Strong Leadership, a super PAC that bought at least $120,000 worth of television advertising this week in support of Minter’s campaign. Funded by EMILY’s List and five wealthy Vermonters, the organization is run by retired KSE Partners lobbyist Bob Sherman. Contrary to Dunne’s assertion, the super PAC is not directly affiliated with Sherman’s former lobbying firm. Galbraith — a multimillionaire who has largely self-funded his own campaign — disputed Dunne’s assertion that Hoffman’s ad buy was truly independent. Minter said she was “against super PACs” and believed “the role of big money in politics is undermining our democracy in very serious ways.” But she denied coordinating with Vermonters for Strong Leadership, claiming she first heard of the super PAC when Seven Days contacted her campaign manager late Wednesday for comment. “Nothing I can do about it,” she said. “We cannot coordinate,” Minter insisted.